The Hand of Glory - a rather worrying amulet - is reputed to make its owner invisible and paralyse anyone who looks at the light it emits. Highly prized by thieves and burglars, a few rare specimens can still be found in museums. The Surnateum's specimen was acquired in London in the 1920s. The term 'Hand of Glory' is a translation of the French main de gloire, derived from the old French mandaglore and ultimately from the Latin mandragora, meaning 'mandrake', a magical root highly prized by occultists in centuries past. The Surnateum's specimen has five candles, one for each digit. According to tradition, in this case if the thumb candle does not light, then that means that one of the individuals targeted by the 'spell of fascination' will not be affected and will have the thief captured. In t his case, the wise burglar cautiously avoids the house in question. According to legend, anyone wishing to counteract the Hand of Glory's spell must throw milk on it to extinguish the candles. Next a a kind of candle is made with the fat from a hanged man, virgin wax and Lapland sesame . 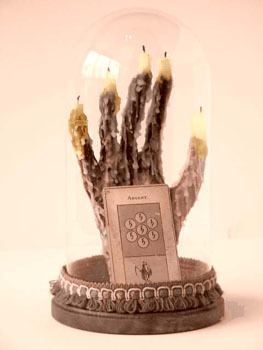 The Hand of Glory is used as a candlestick to hold this candle when lighted. Wherever one travels with this baleful instrument, those who are already there will remain immobile, unable to move as if they were dead." The Surnateum's Hand of Glory can rather easily open the lock on a safe, but less easily the doors of buildings, at least those in the Surnateum. Our Museum of Supernatural History is protected by spells infinitely worse than anything you can imagine. The last time a dishonest visitor committed a petty theft at the Museum, not only was the object returned to the Surnateum within two days, but part of the thief's family was decimated. These kinds of protective measures may explain why the Hand of Glory does not function properly within the Museum.